Potent anti-inflammatory formula, Relieve inflammatory symptoms such as pain, swelling and joint stiffness with Fusion Curcumin Advanced - specially formulated for arthritis and other painful joint problems. Regardless of where it occurs in the body, inflammation is typically characterised by symptoms of pain, swelling, heat, stiffness and reddening of the affected part. These symptoms are caused by the presence of compounds called inflammatory mediators, which may also cause damage to the injured or inflamed tissue. Curcumin exerts powerful inhibitory actions on many inflammatory mediators and may have therapeutic benefits in osteoarthritis, rheumatoid arthritis, sports injuries and many other conditions associated with pain and inflammation. However, under normal circumstances Curcumin is not readily absorbed and utilised by the body. To overcome these issues, Fusion Curcumin Advanced combines Curcumin with Piperine, which is derived from Black Pepper and enhances the bioavailability of Curcumin by up to 20 times. Ginger further enhances the uptake of the other herbs in this formula thanks to its content of Gingerols, and provides additional pain relief and anti-inflammatory activity, as does the Ayurvedic herb Boswellia. 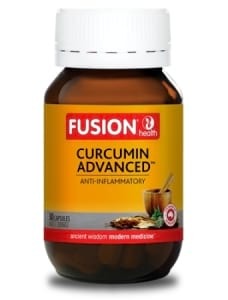 From the perspective of Traditional Chinese Medicine, Fusion Curcumin Advanced is a warming formula that works by invigorating the Qi, enhancing Blood circulation and opening the body`s energetic channels. This promotes healing and disperses the stagnation that often characterises inflammatory conditions.